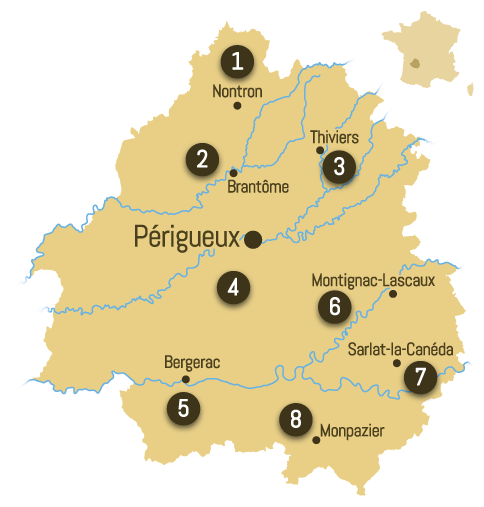 The Auvézère Valley is one of the entrances of the Périgord and the place to discover nature. During your walks you’ll discover meadows and agricultural lands, walnut plantations or fields divided by dry stone walls. In the middle of all this arises the castle of Hautefort. This medieval fortified castle became a leisure residence in the seventeenth century and retained some beautiful interiors and French gardens. Smaller cities, such as Excideuil, are also worth a visit and at Thiviers and Sorges, gastronomy is king: you’ll find there the foie gras museum and the museum of the truffle mushrooms. Both pay homage to the gastronomic riches of the Green (“vert”) Périgord. Nearby the Hautefort castle, the caves of Tourtoirac alone justify a stay in the region. Their calcareous concretions are particularly beautiful. Throughout the Périgord Vert, several campsites welcome you to their green pitches or in comfortable rentals. Whether in classic accommodations, such as mobile homes, or in unusual ones like tree houses or Lodge tents.